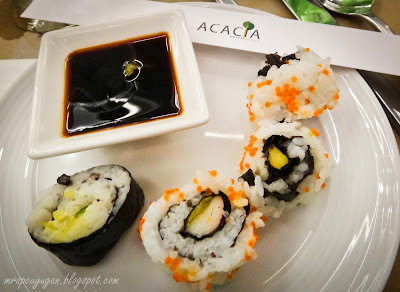 We had dinner at the Acaci during our overnight stay at Acacia Hotel. The best part about my meal is that it was free! 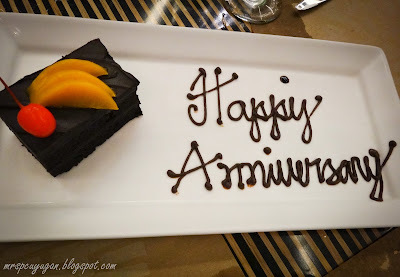 Mr C won a gift certificate for a buffet dinner for two and we decided to use it during our visit. The dining area at Acaci. 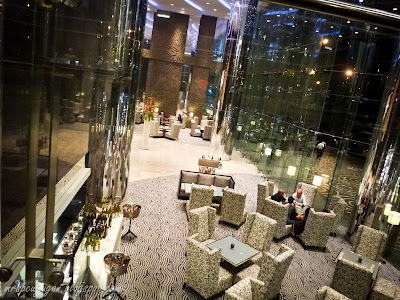 A view of the lobby. 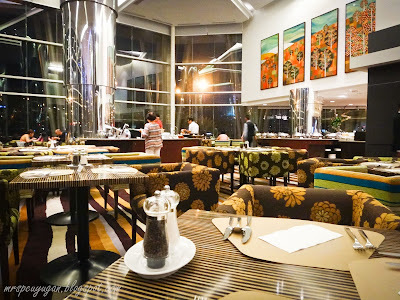 You can spend happy hour here and indulging in their wine or beer buffet. 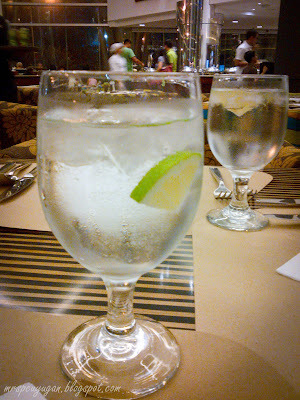 Enjoying my glass of water with lime while waiting for the boys to come back. As usual, I forgot to take photos of the buffet stations. As far as I can remember though, they had assorted breads with spreads and cheeses, a salad station, appetizers and sushi, pasta station, carving, entrees and desserts. Buffet dinner comes with one round of iced tea or pandan juice. 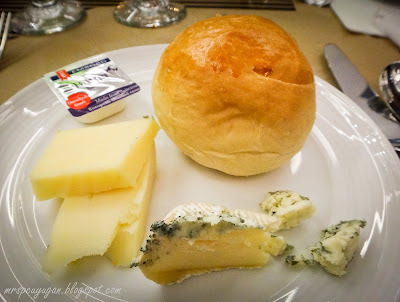 Plate#1: Dinner roll, butter and assorted cheeses. My favorite! Plate#2: Smoked salmon with dill sauce, potato salad, roast beef salad and chicken something. 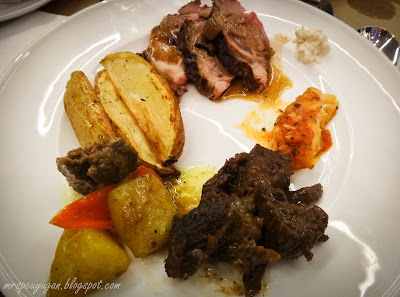 Plate#4: Main Course: Roast lamb with roasted potatoes, lamb curry with potatoes, cream dory in red sauce. 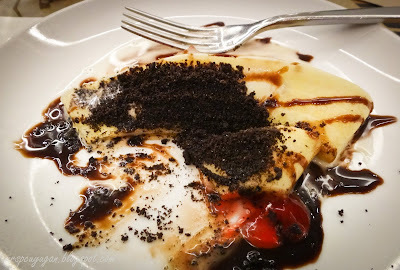 Plate#5: Dessert: Mango vanilla crepe with chocolate syrup, strawberry syrup and crushed Oreos. This is the little boy’s creation. Take a peek into our room. I’m not sure how I feel about the food. I only tried a a few viands because nothing else interested me. Out of everything I had, I enjoyed the curried lamb the most, although it was on the salty side. That’s one thing I noticed, the food is either bland or salty. I can’t even say over seasoned, just salty. The good news is the little boy enjoyed his bowl of pasta, his plate of chicken teriyaki and rice plus sinigang soup, and the chocolate fountain. 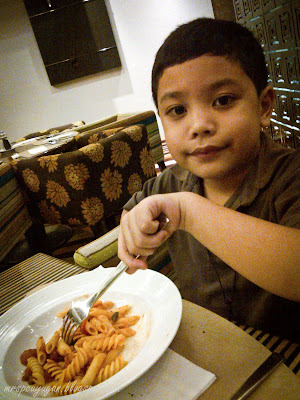 Mr C also had a lot to eat, so I’m guessing he enjoyed himself as well. 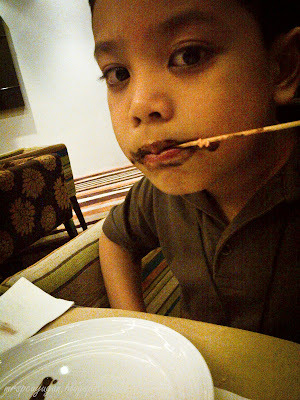 Chocolate child on his 2nd round of dessert. The sweetest ending – a really thoughtful surprise from the hotel’s Marketing Department. Thanks so much for making our stay extra special, Marla and Zita! We were all so stuffed after dinner that we decided to go to the pool area to lounge around and have coffee before going to the room. It was a really good decision, otherwise we would’ve gone straight to bed for sure! 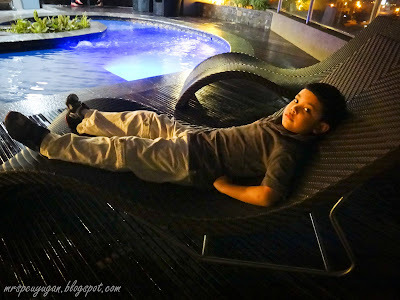 Busog boy hanging out by the pool. 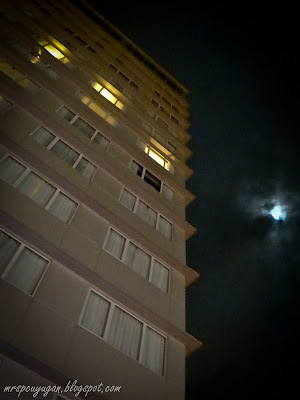 I think our room is the one up there with the curtains open. 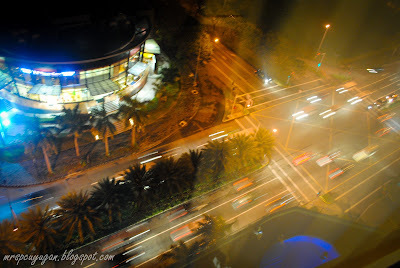 It’s really windy at the pool area of Acacia Hotel. I thought it was only chilly because we were there at night, but I found out when we went for a swim the next day that it really is cold up there! Brr! 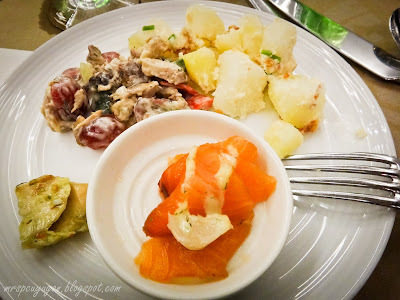 Speaking of swimming, check out our second day at the hotel, plus our breakfast meal at Acaci. Yup, more eating. Burp.